Delaware County Auditor George Kaitsa, left, and Meals on Wheels volunteer Steve Conway, right, load meals into Conway’s car for delivery Tuesday. Area community and business leaders came together Tuesday to help deliver meals to residents across Delaware County through SourcePoint’s Meals on Wheels program. The local figures who participated were paired up with drivers, and the tandems delivered meals to older individuals in the community, while also helping to promote SourcePoint’s upcoming Boxed Lunch Fundraiser. SourcePoint reports that last year more than 218,000 meals were served to local seniors through the Meals on Wheels program, which was an increase from the 201,664 they served in 2016. SourcePoint reports Meals on Wheels provides hot meals delivered by volunteers, and in addition to providing nutrition and sustenance, the program also provides families with the knowledge that someone is regularly checking on their loved ones. Delaware County Auditor George Kaitsa was one such volunteer Tuesday, and he said it was his ninth year of taking part in the Meals on Wheels event. Kaitsa said he was very pleased that so many business and government leaders took part in the event and said it was an excellent way to reach the community. SourcePoint’s fourth annual Boxed Lunch Fundraiser in support of Meals on Wheels will be March 20-22. Boxed lunches will be delivered to local businesses and organizations as part of a community effort to support the program. The fundraiser, presented by OhioHealth and Trucco Construction, provides a lunch for $10, with $5 benefiting Meals on Wheels locally. Additional sponsors include Inno-Pak, Ohio Living Sara Moore and Humana. The boxed lunches, provided by the Delaware County Community Market, include a choice of a turkey and cheddar cheese croissant sandwich or a vegetarian wrap, as well as cucumber-tomato salad, seasonal fresh fruit and a chocolate chip cookie. To place an order by March 9 or to make a donation to SourcePoint’s Meals on Wheels program, go to MySourcePoint.org/lunch. To learn more about SourcePoint’s Meals on Wheels program, visit MySourcePoint.org. 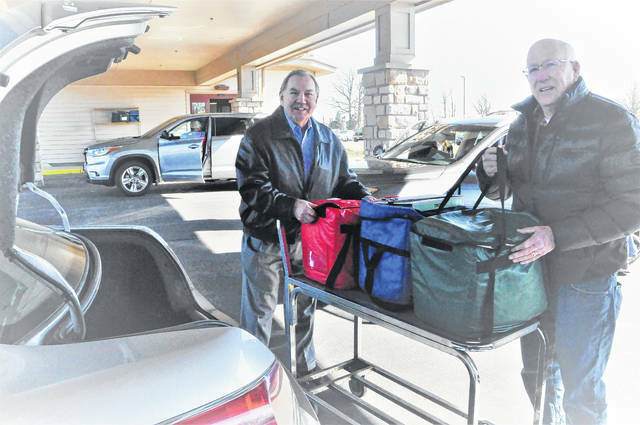 https://www.delgazette.com/wp-content/uploads/sites/40/2018/03/web1_Meals-on-Wheels.jpgDelaware County Auditor George Kaitsa, left, and Meals on Wheels volunteer Steve Conway, right, load meals into Conway’s car for delivery Tuesday. This entry was tagged Sourcepoint. Bookmark the permalink.